Aerial photograph of Glatton airfield, 9 May 1944. Photograph taken by the 7th Photographic Reconnaissance Group. 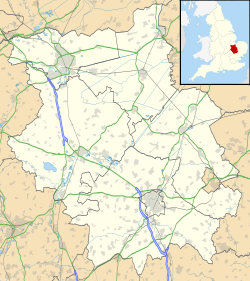 Royal Air Force Glatton or more simply RAF Glatton is a former Royal Air Force station located 10 miles (16 km) north of Huntingdon, Cambridgeshire, England. Glatton Airfield was built mostly in the parish of Conington, Huntingdonshire by the United States Army 809th Engineer Battalion (Aviation) starting in the fall of 1942 and throughout 1943. It was built on farmland owned by the Rose Court Farm, which remained a working farm inside the airfield's three runways that surrounded the buildings of the farm during the war. When completed in late 1943, the facility was placed under the jurisdiction of the Eighth Air Force, United States Army Air Forces. Glatton was assigned USAAF designation Station 130. B-17s of the 457th Bomb Group attacking a target. Aircraft in foreground is Boeing B-17G-40-BO Fortress Serial 42-97075 "Flak Dodger" of the 750th Bomb Squadron. This plane survived the war and returned to the USA in June 1945. The airfield was first used by the 457th Bombardment Group (Heavy), arriving from Wendover AAF, Utah on 21 January 1944. The 457th was assigned to the 94th Combat Bombardment Wing of the 1st Bombardment Division. Its tail code was Triangle U. The 457th Bomb Group flew its first combat mission on 21 February 1944 during Big Week, taking part in the concentrated attacks of heavy bombers on the German aircraft industry. Until June 1944, the Group engaged primarily in bombardment of strategic targets, such as ball-bearing plants, aircraft factories, and oil refineries in Germany and Occupied Europe. The Group bombed targets in Occupied France during the first week of June 1944 in preparation for the Normandy invasion, and attacked coastal defenses along the Cherbourg peninsula on D-Day in support of airborne forces who had landed on the peninsula. It struck airfields, railroads, fuel depots, and other interdictory targets behind the invasion beaches throughout the remainder of the month. Beginning in July 1944, the 457th resumed bombardment of strategic objectives and engaged chiefly in such operations until April 1945. Sometimes flew support and interdictory missions, aiding the advance of ground forces during the Saint-Lô breakthrough in July 1944 and the landing of British 1st Airborne Division at Arnhem during the airborne attack on the Netherlands in September 1944; and participating in the Battle of the Bulge, December 1944 - January 1945, and the assault across the Rhine in March 1945. The Group flew its last combat mission on 20 April 1945. The unit had carried out 237 missions. Total number of sorties was 7,086 with nearly 17,000 tons of bombs and 142 tons of leaflets being dropped. After V-E Day, the 457th transported prisoners of war from Austria to France, and returned to Sioux Falls AAF, South Dakota during June 1945 and was inactivated on 18 August 1945. After the war, RAF Glatton was used by the RAF's No. 3 Group under the control of RAF Bomber Command using Avro Lancasters and Consolidated Liberators flying to the Middle East. It was closed and sold in 1948. Glatton Airfield Water Tower Memorial to USAAF 457th Bomb Group. With the end of military control, Glatton airfield was largely returned to agriculture. However, parts of two runways have been retained and Glatton now operates as Peterborough Business Airport. All Saints Church Conington churchyard contains a memorial to the men of the 457th Bomb Group who lost their lives on missions that flew from Glatton. ^ a b "Glatton". American Air Museum in Britain. Retrieved 8 Mar 2015. ^ a b c d Bloody Skies: U.S. Eighth Air Force Battle Damage in World War II. 2014. ^ a b "RAF Glatton". cambridgemilitaryhistory.com. Wikimedia Commons has media related to RAF Glatton.